He weaves through the spaces of the bench beneath me, and I watch with keen eyes through these spaces. They are large enough to glimpse the way the grass underneath my eyes darts back and forth as I rock back and forth, a blending of green hues in the form of elongated slices. I haven’t moved myself in many moments, yet I still rock. I hear the ocean frolic around the rocks just beyond my reach. Yes, the ocean, I am staring at the ocean, the ocean. I almost feel like the waves are the ones pushing me, they way they roll back and forth along the surface, I move with them. They dip back, I dip forward, they press on, I press back, we move endlessly like a soft Newton’s cradle. I am the song “Near Light” by Ólafur Arnalds, I am the violin swaying along the curves in the spaces of the fjords. 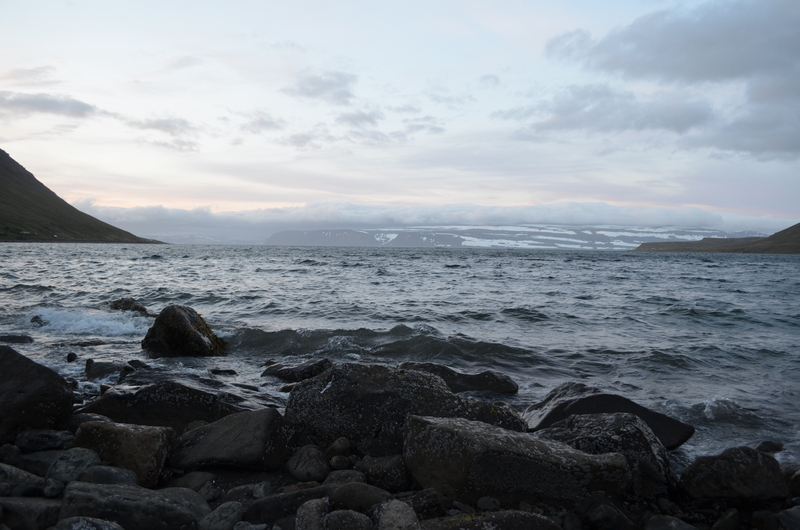 I am in Ísafjörður. 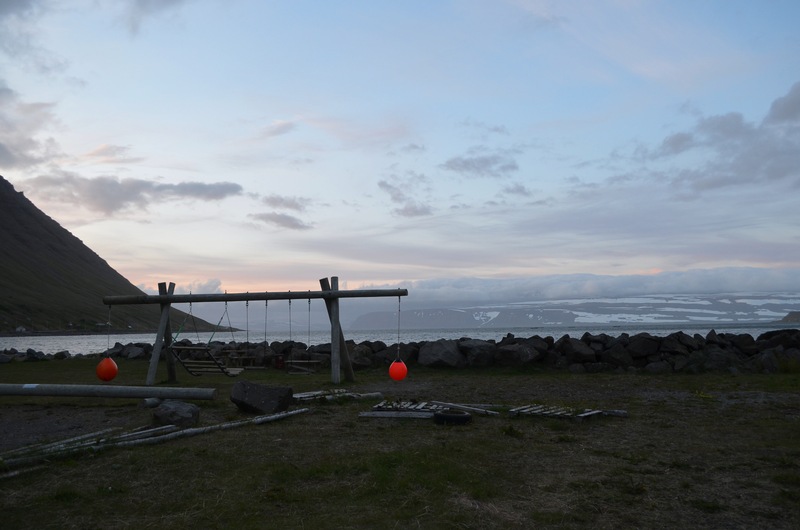 I am in the Westfjords. I am here, staring at a brilliant, powerful body of water as it beckons me. I am also alone. But what does “alone” even mean? Surrounding me is a phenomenon: mountains with curves that make them look as if they’re rolling into the ocean, as if they want the ocean, need they ocean. They know this, they know this feeling so well. They cautiously roll away from themselves, a crumbling of fragments, a few at a time, tumbling over their larger selves. You can tell they want this. They’re like rain rolling down glass, they can’t help themselves, and so they roll. And I spend a lifetime watching in awe, two lifetimes watching, three, four, more, until the whole mountain ends in the sea. The mountains look like longing. I wonder if they see that I see what they yearn for, and I wonder if they see that I yearn for it too. I wonder if they’ll take me with them, if the surface of the ocean will kindly accept my own passing through. The surface is a giant gate, the entrance to the breathless. But again, what does “alone” mean? What does alone mean as I rock towards a seemingly empty harbor of life rebuilding itself into other things? They say rocks aren’t living things but I beg to think otherwise. I look at them and I see parts of myself I didn’t even know I had. I see parts of myself crumbling away in methods less than a pattern, I see the exterior and wonder how much more beautiful the interior is. There is something deep within the mountains that no one may ever see. Something hidden, something private, something unimaginably exquisite. I want to press a piece of paper to a mountain’s surface, whisper “it’s okay, you can write about it” and watch where the rocks indented between each loose-leaf line. It will be a rough code but someday soon I will decipher it. My one goal in life is that my atoms may one day separate and become part of these mountains. I am content with my own death if there is a chance. I close my eyes again and wait for the crashing wave to rock me back to a new space. As it lulls itself back into itself, I listen to it pulling me back with it. Everything points out there, out to the unfurnished landscape. 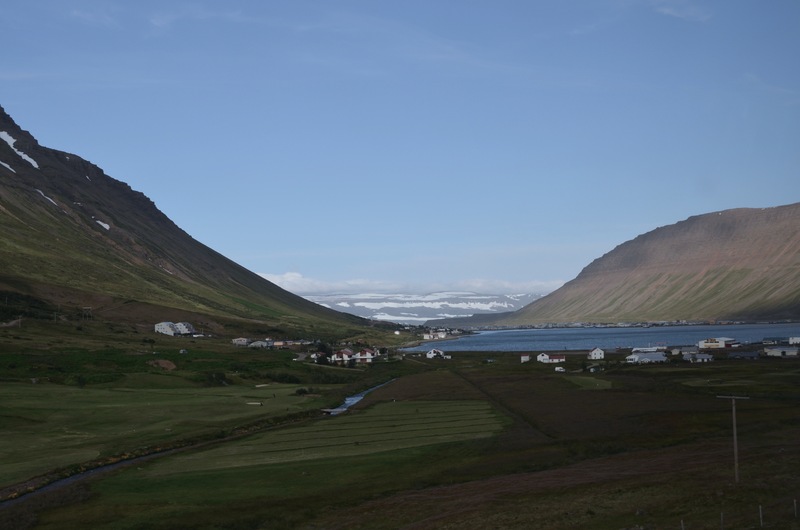 The town of Ísafjörður kindly waits behind me, waiting for me to turn back around, but I’m not ready yet. I’m afraid of turning back around. This entry was posted in Uncategorized and tagged Ísafjörður, mountains, Westfjörds. Bookmark the permalink.